Exploring Australia by Road - a fantastic way to see and experience this amazing country. The benefits of taking yourself exploring by road is that you can go wherever you like, you see and experience what you like and you can stop whenever you like! When I see something anytime I'm travelling and I'll stop to check it out - whether it's one of our incredible wildlife species, a beautiful sight over our sparkling oceans or a view that you can get lost in from on top of our mighty mountain ranges or even to stop and grab a cuppa in the many unique towns along the way. Plus you get to meet some real characters who can often point out special places of interest that are possible not in tourist brochures. Travel safe and maybe we'll meet on the road! The Australian Government and Driver Reviver program recommend stopping every 2 hours for at least 15 minutes to avoid fatigue. Aussies have all heard the stats on driver fatigue related crashes and fatalities at one point or another. However, each holiday period there is a spike in these crashes, so it seems drivers need a little reminder to stop and rest. Plan your trip and rest stops - Map out your trip and break it down into smaller chunks to ensure sufficient fuel stops, avoid late night driving and dangerous roads. Use a tool like this Pit Stop Planner to make sure you stop and take a rest regularly to avoid fatigue and take in the sights. Driving when well rested also helps keep us alert for wildlife suddenly appearing on roads. Whenever possible, do not drive at night outside of towns and major cities. A lot of Australian Wildlife comes out at night - especially kangaroos. Kangaroos move around more at night than they do in the day. Dawn and Dusk are the times to really be on the lookout. During the drought in Australia, animals are known to wander into towns in search of food and water, so be on the lookout at all times. In really bad droughts and hot summers, it is not uncommon to find wildlife in towns - some towns have large animals are birds living in their towns all year round such as kangaroos, emus and cassowaries so always be on the look out for wildlife. 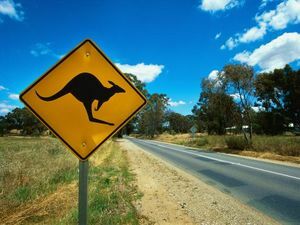 The animals that are more common on the Australian roads are Kangaroo, Echidna and Wallabies. Other animals that you might come across are Emus, Eagles and other bird life, wandering Cattle, Camels and Brumbies (Wild Horses). In the outback, be especially careful of wandering stock that move onto the roads at night to sleep. The outback can get very cold at night time and the roads are still warm, so the cattle move to the warm roads to sleep. In areas such as the Daintree in Northern Queensland - be aware of Cassowaries - there are less than 1500 left in the wild and they are often sighted crossing roads. 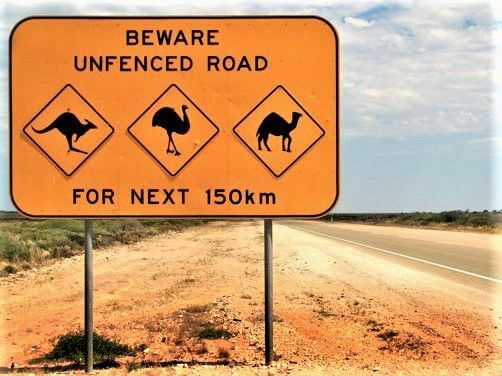 Slow down in the areas of the Cassowaries, the areas are well sign posted so please be Cass - o - wary. Many areas that are high traffic areas for wildlife are well sign posted - but remember, wildlife can't read so it doesn't always stay between the signs! One of the best things about driving through Australia is seeing the wildlife along the way. 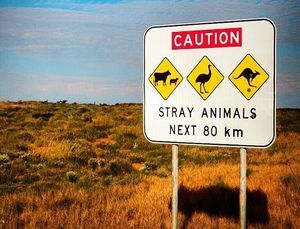 As obvious as this is, remember you are driving in Australia and not only do we have to watch for wildlife while driving but wandering stock as well. Not all wildlife and vehicle collisions are in the country areas. Major cities of Australia are known to have wildlife and vehicle collisions too so stay alert at all times in all areas. Watch the road sides and into the paddocks as well. Wildlife use natural corridors to move around as well. What are wildlife corridors? Glad you asked! Wildlife corridors are connections across the landscape that join up areas of habitat, they help species move from shelter, to food, to water and even to find a mate. Try to avoid driving at dawn and dusk and for the first couple of hours after it gets dark where animals live as this is when the animals are generally more active and move around more to feed. If the locals tell you to be off the road before dark - I recommend you take their advice! But remember, wildlife is active during the daylight hours too so always be on the look out. Be Alert in any areas that may have wildlife or are sign posted that animals are in the area, such as open country roads and national parks. Take notice of wildlife warning signs. These are generally placed in areas of high populations of wildlife. Signs may have just a kangaroo on them, but there could also be other wildlife species in the area. Pay close attention to these signs and be aware that wildlife can't read and don't always stay between the signs. When you drive slower in poor visibility, where bushland comes right up to the edge of the road or where animals are known to roam, will give you a better chance of avoiding a collision with an animal - which can save the life the animal and possibly injury to you and damage to your vehicle. Whenever you can when driving, use your high beam lights so that you can see the sides of the roads better and further down the road at night. Be aware, that animals can be dazed by bright lights and may not move off the road. Dip your headlights - do not flash the lights, and if possible - slow down and sound your vehicles horn as soon as you sight the animal. This may give the animal a chance to move off the road. Your Own Safety should always come first. When you come across an animal in the path of your vehicle, your natural instinct may be to swerve to miss hitting it. But, this can put you, your passengers and other motorists in danger. Always keep full control of your car, unfortunately, sometimes it might not be possible to miss an animal. Animals can often be very unpredictable. Whenever possible, brake gently and give them time to move off the road. Always keep an eye out for more animals. With Kangaroos, where there is one, there is often more. Always when passing an animal, be aware that they may come back across the path of your vehicle and that there may be other animals. If you see a dead animal by the roadside, honk your vehicles horn as early as you see the dead animal. This can scare off any Eagles, other birds of prey, Dingoes and any other animals feeding on it so that they don't become another road kill victim alongside the animal they were feeding on. Unfortunately, this is a common problem. To really help our wildlife that feed by scavenging, remove the dead animal from the road. Animals feeding on road kill often fall victims to collisions with vehicles as they cannot always move away from their food source quickly enough and often move into the path of the oncoming vehicle in a panic. 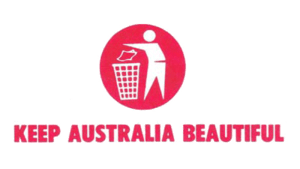 Carry disposable plastic gloves to do this - keep the gloves after use and dispose in the next available rubbish bin. Often on the roads where animals are present, signs are put up with phone numbers to call for help if wildlife is injured. When you come across these signs, put the details into your mobile phone, you may just need them one day, or another motorist might. An easy way to grab a number on the go is to take a photo of the sign with your mobile camera or digital cameras as you can pull up the photo if needed at anytime. Create your own Basic Wildlife Rescue Kit for your car. It is against the law to throw anything from a vehicle. Throwing food scraps and rubbish that has had food in it out of your car is not only illegal, but it can attract wildlife to feed on the scraps on the roads, which increases the chances of them being injured or killed and makes the road sides unpleasant to look at. Take a bag in the car for your rubbish and put it in a bin when you find one.